I first heard the statement, God’s Got It when I did an interview with one of Israel’s sports hero’s. I asked if he could explain how Israel has survived over the past fifty plus years? His answer was , “There is only one explanation, God’s Got It. ” That saying has stuck in my mind for a number of years and God has lead us to develop a major campaign utilizing social media and a world wide television network. * $25,000 travel to Israel for guest and expenses. You have the opportunity to be part of an amazing project that blesses Israel and will show the world how Israel is fulfilling what God has promised. Our flagship website is http://godsgotitisrael.com. We also back that up with a Facebook page, Twitter and You Tube . We will be producing new content on a weekly basis; much of the content will be shot in Israel. We will be taking high profile people and great story tellers to Israel and we will show the world Israel through their eyes. 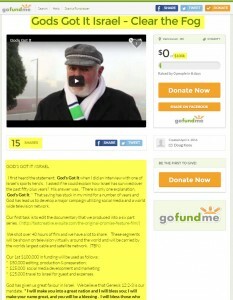 Please donate and show your support of God’s Got It / Israel TODAY!! This article was posted in Causes and tagged Donate, GGII, Gods Got it Israel, Help, Israel, The Original Promise.